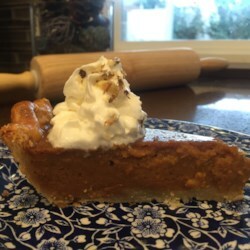 I had never made any kind of pumpkin pie before, but this one turned out so well that I never WILL make a "real" pumpkin pie! The butternut squash was easy to work with, and the whole recipe was simple. The only slight problem I had was getting the pie into the oven without spilling, since it was quite liquidy before cooking (but it turned out the perfect consistency). We had it with whipped cream on top--yum! The second time I made this pie, I didn't have any of the frozen/unbaked pie crusts. I used a graham ready-made pie shell, and it turned out great! The liquid seeped into the crust, giving it some flavor and preventing it from burning in the oven.